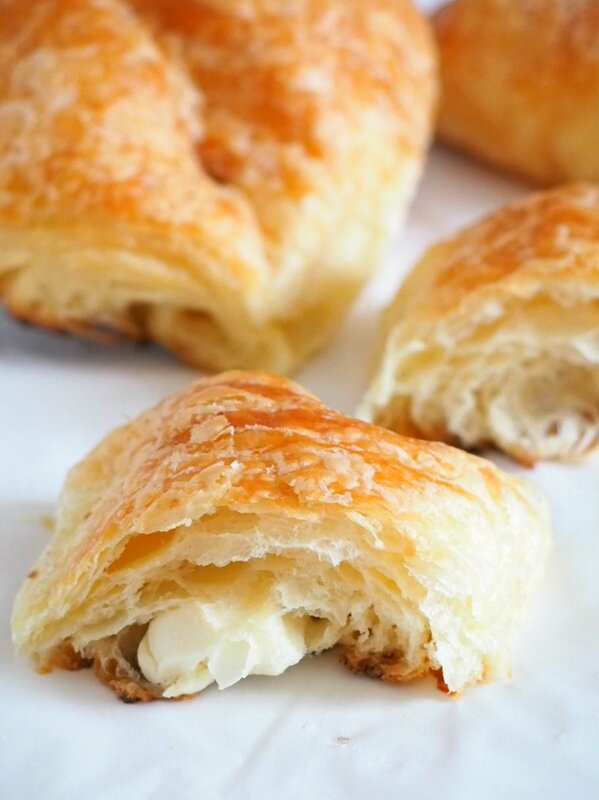 The cream cheese is nicely nestled between the buttery and light layers of these cream cheese croissants. 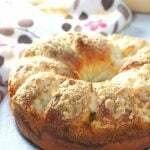 These pastries are so irresistible with their golden exterior and their flaky, delicate tops. Today, we continue savoring the delicious goodness of the pastry that is croissant. I am definitely on a roll, you guys and I don’t know when will I ever stop. I totally enjoyed making croissant dough that I posted last week, and then we started with these heavenly breakfast treats, Tartine’s morning buns. 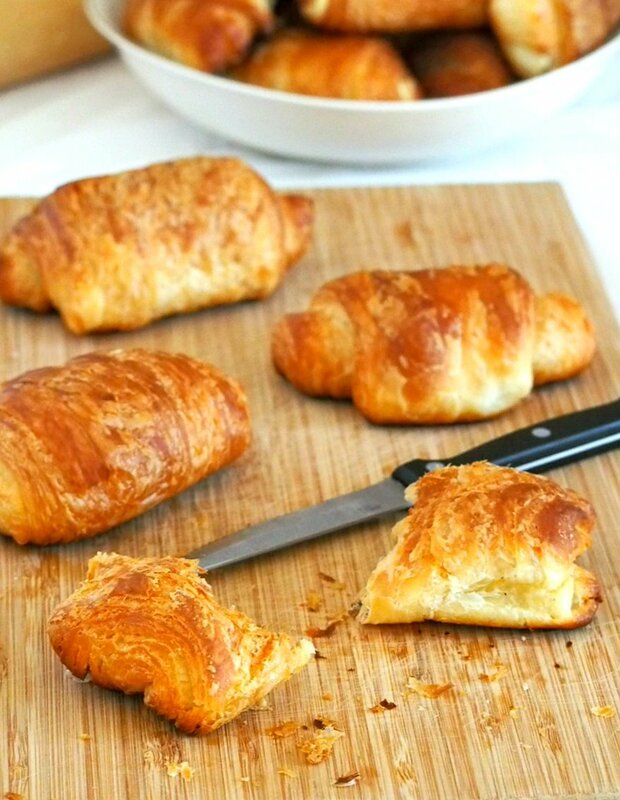 Although making croissants can be a long process, the reward that you get is totally worth your time and effort. 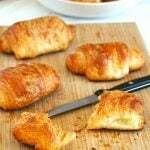 The buttery, flaky exterior and the soft, light layers inside, they can get you so hooked that you will want to make croissants every week. Or maybe that’s just me. But still. Now, as an added variety, we have these cream cheese croissants. Cream cheese. It was not hard for me to come up with this one. I have totally seen it coming. 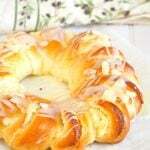 To incorporate cream cheese into the beautiful layers of croissant, why not? I think this is the point where I convince you to drop all your inhibitions and just make the croissant dough. If you are still on the fence, I suggest that you just go right in and get your hands rolling and folding. 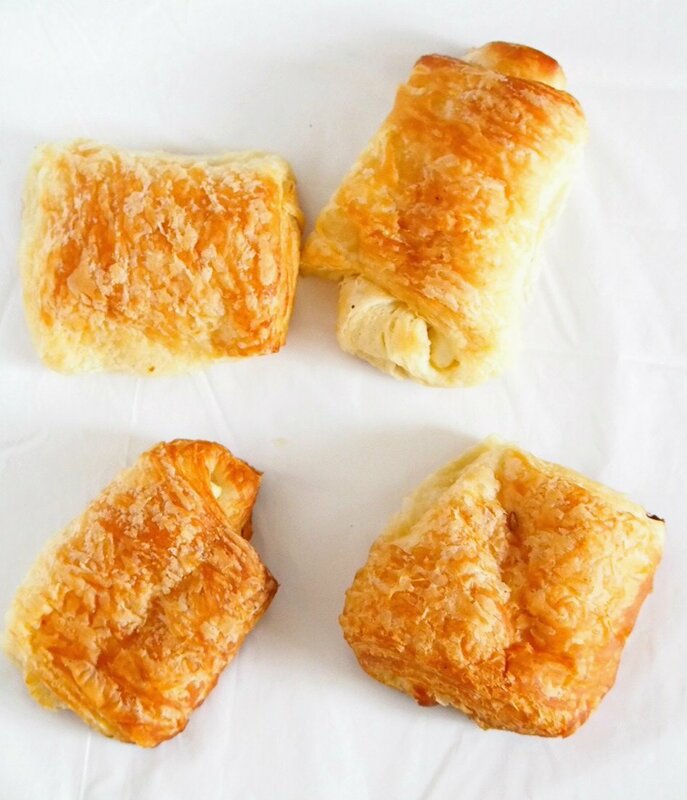 Just make these croissants. It may seem hard. It may seem at first that you have got yourself into trouble but, really, all you need is to take your time, break the process into single, simple steps and you are going to be fine. Trust me. Once you do the final fold of the dough, and especially once you see your assembled pastries have risen nicely, you will feel like you have just accomplished something great. The warm, fresh out of the oven croissants will be the extra, delicious bonus. Once you have chilled your final croissant dough for at least 8 hours, divide it in half and put one half back in the fridge, wrapped tightly in plastic wrap. Roll the other half into a 10 x 18 inch rectangle. Using a sharp knife or a pizza cutter, cut the dough into 4 sections horizontally, and four sections vertically so that you have 16 small rectangles. 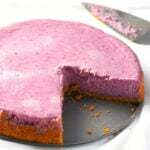 Place a strip of cream cheese on one of the short edges of a rectangle. 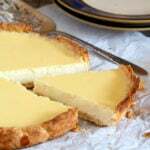 The cream cheese should be chilled beforehand so it is easier to cut them and position them in the dough. 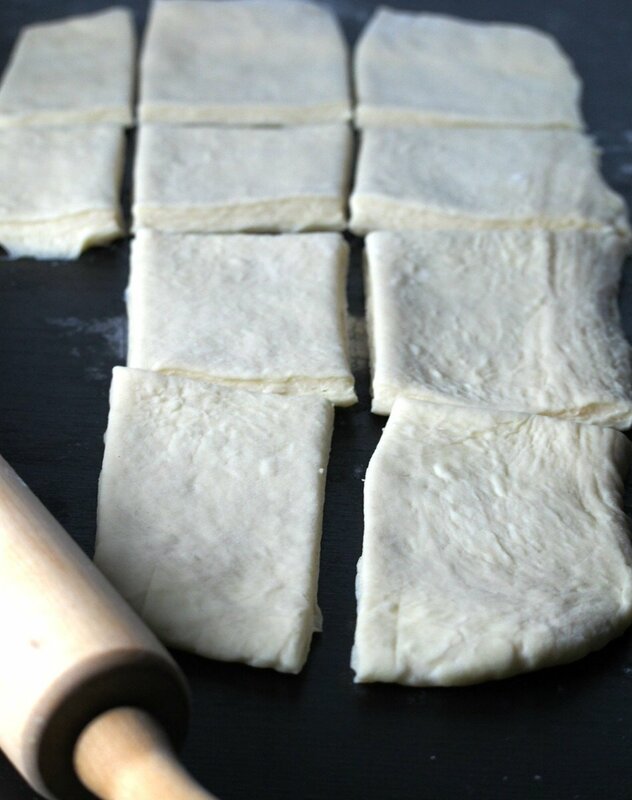 Starting on the short side of the rectangle, roll the dough while lightly stretching the other end in the opposite direction to get a nice tight log. Repeat the process with the rest of the rectangles and place them on a large baking tray. Leave about 2 inches space in between each pastry. You are going to need two trays for all of them. Cover the pastries loosely with plastic wrap and let them rise for 2 hours. Note: You can double line the baking trays with parchment paper to avoid over browning on the bottom of the croissants. Preheat oven to 425 F. Once the temperature is achieved, use a spray bottle to spritz water generously inside the oven. Close the door briefly then put in the baking trays. Spritz with water once more, then close the door. Lower the temperature to 400 F. Bake the croissants for 8 minutes without opening the oven door. Then, switch the position of the trays and rotate them 180 degrees. 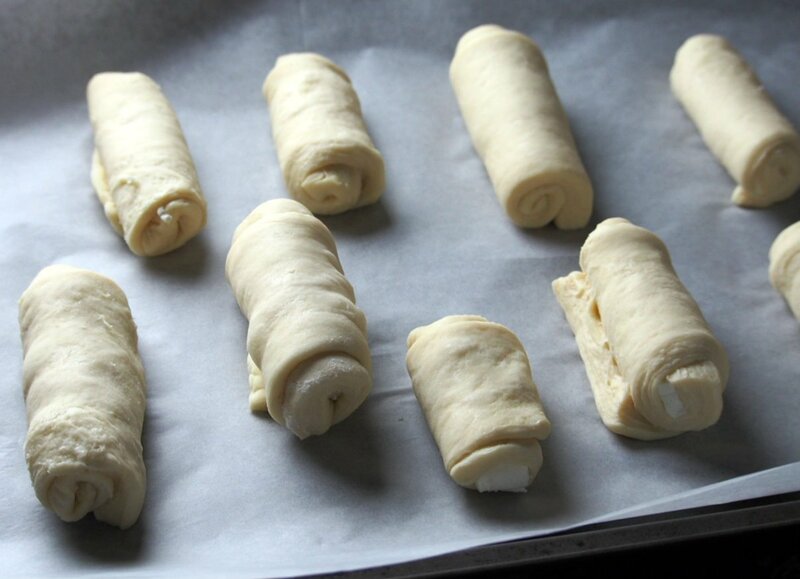 Lower the temperature to 375 F and bake the cream cheese croissants for 5-8 more minutes or until the tops are golden. I really enjoyed that early morning assembling these pastries while my kids were sleeping. But of course, what I enjoyed the most was munching on these lovely cream cheese croissants while the house still smelled wonderful from baking these treats. Note: You can use the other half of the dough right away within the day or freeze it for no more than 2 days. Just wrap it nicely with a plastic wrap, then in foil. 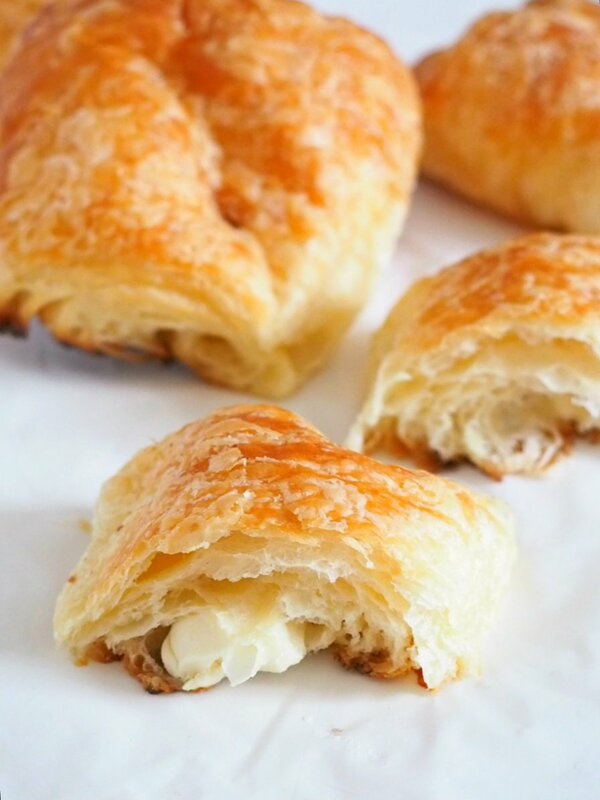 These cream cheese croissants are irresistibly flaky, buttery and golden pastries. 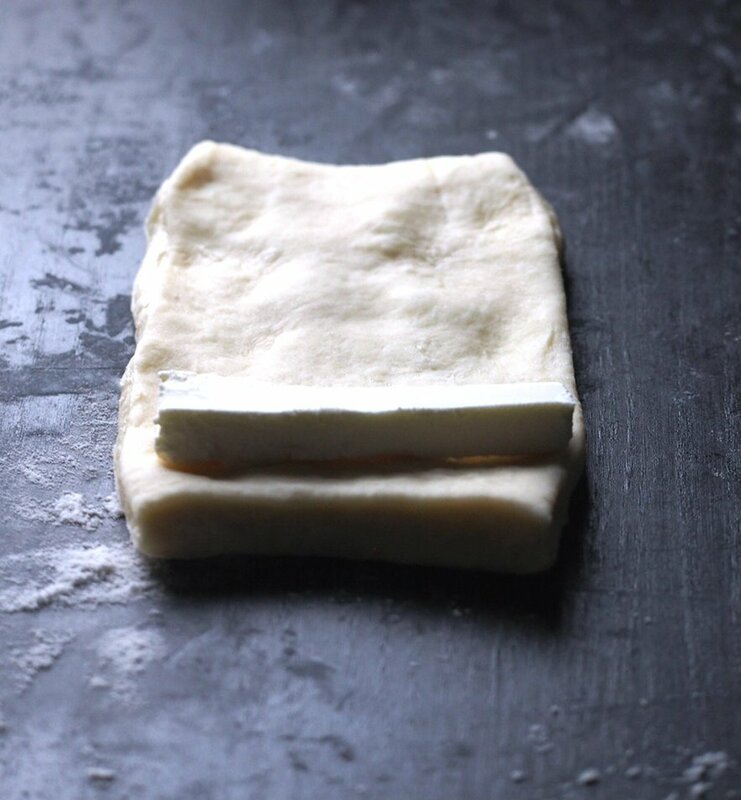 In a lightly floured surface, roll the croissant dough into an 18 x 10 inch rectangle. Dust off flour from the dough. Using a sharp knife or a pizza cutter, cut the dough into 4 sections horizontally, and 4 sections vertically to form 16 rectangles. Cut cream cheese into strips about 3 to 4 inches long and 1/2 to 1 inch thick. Place a piece of cream cheese on one of the short edge of a rectangle. Stretch the dough briefly, then fold the dough over the cream cheese. Roll it to form a tight log while keeping the dough taut and stretched using the other hand. Place each rolled dough on a large baking tray that is lined with two layers of parchment paper. Repeat process with the rest of the dough. Position the rolls two inches apart from each other. You will need two trays. Cover the dough loosely with plastic wrap and let rise for 2 to 2 1/2 hours. Preheat oven to 425 F. using a spray bottle, spritz water generously on the inside of the oven and close the door briefly. Place the croissant trays inside the oven and spritz with water once more before closing the oven door. Lower the temperature to 400 F and bake the croissants for 8 minutes without opening the door. After 8 minutes, switch the position of the baking trays and rotate them 180 degrees. Lower heat to 375 F. Bake for another 5-8 minutes or until the pastries are golden.